All three boys and I whipped these up this morning to start decorating for Easter. 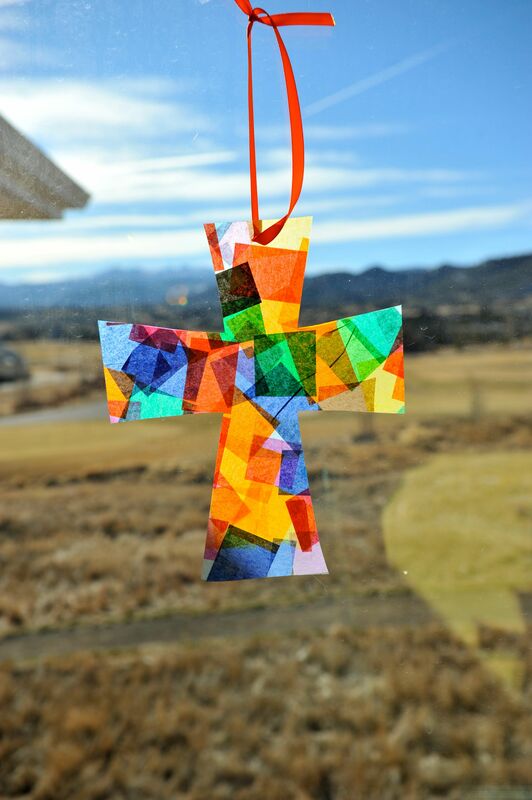 We also made some EGG shaped sun catchers and if you’re handy with the scissors you could even make BUNNIES… For us, this was a great opportunity to talk about the meaning of Easter and the symbolism of the cross, eggs, bunnies, etc..
1. Cut two identical sized rectangles out of contact paper. I cut a large one and let my kids all use it as one canvas, but you could also cut separate ones for each child. You will need TWO identical size pieces per project. 2. 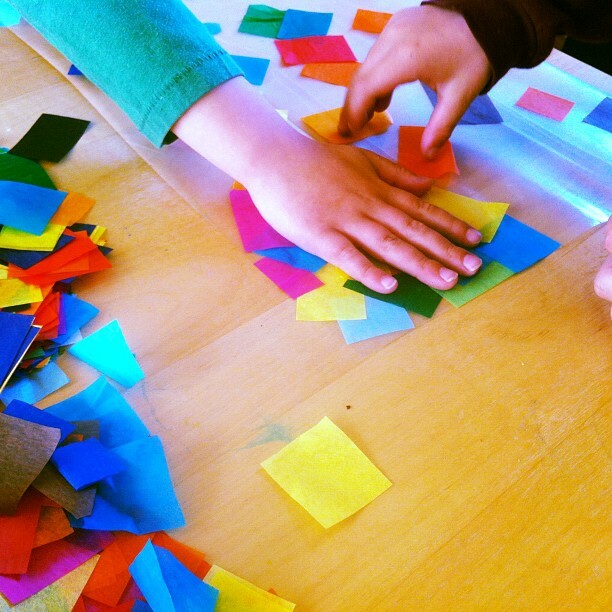 Lay one of the pieces of contact paper in front of your child sticky side up and let them stick tissue paper all over it. If they are young you may need to fill in the empty spots when they are finished. 3. Once the contact paper is covered with tissue take the identical sized piece of contact paper and lay it on the top of the tissue sticky side down. You now have made a tissue sandwich! 4. At this point you can cut out any shape you want. Like I said we made two large crosses, two mini crosses and 4 eggs. 5. 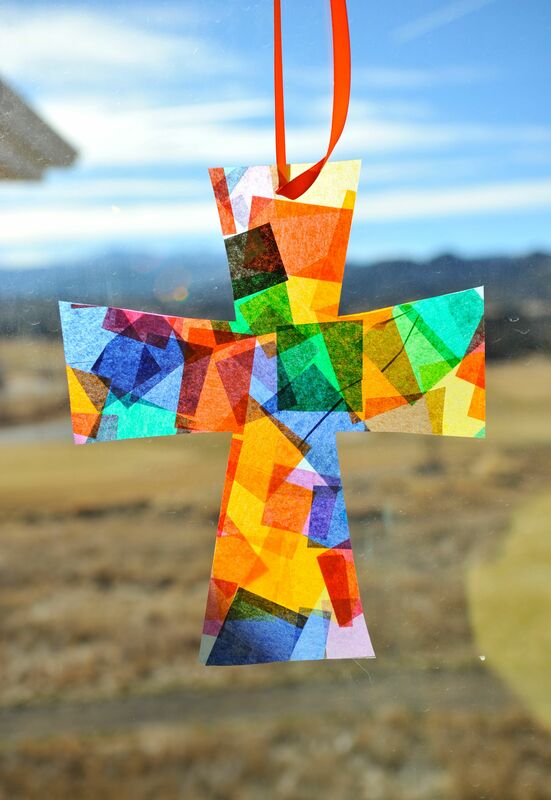 Punch a hole in the top of each shape, tie it with a ribbon and hang it on your nearest window. ** I think these are cute gifts for a Sunday School Teacher, neighbor, daycare provider etc… Have fun!